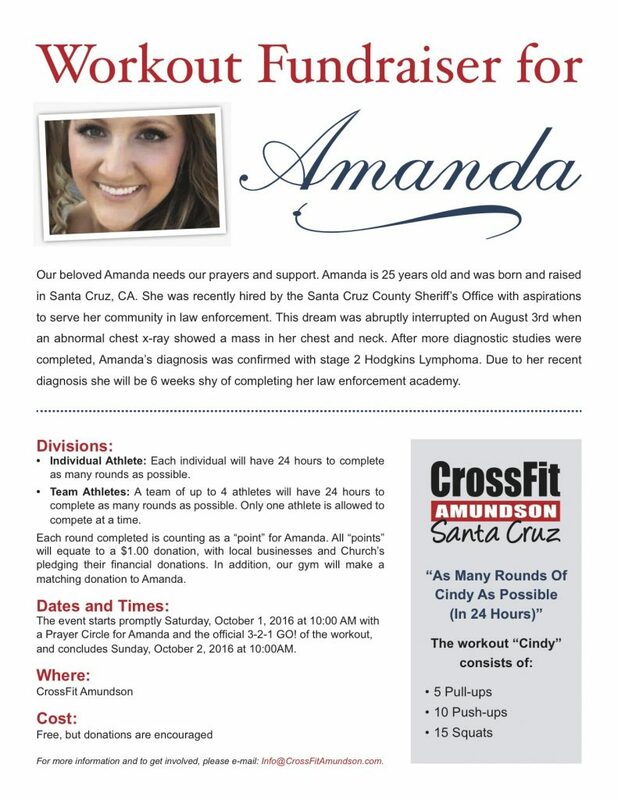 Please join us today from 10:00 AM through Sunday, October 2, at 10:00 AM, for the 24 Hour Fundraiser “Cindy” event for Amanda. The gym will be open a full 24 hours to support this epic event for an amazing person who needs our love, prayers and support. The prayer circle starts at 10:00 AM at our HQ location, with the official “3-2-1 GO!” of the 24 hour start starting immediately after. Please note the 10:00 AM free community workout will be the workout “Cindy” in support of Amanda. All levels are welcome and encouraged to participate! Please note our gym has a modified schedule on Monday, October 3. On Monday, there will be Open Gym from 11:00 AM – 4:00 PM. All other classes will be cancelled.